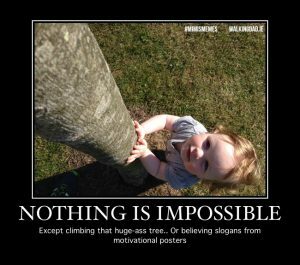 For those of us who find ‘hang in there, kitty’ posters condescending and annoying (I can’t be the only one), I thought we could do with a new angle in the motivational poster trope. While we dream of facilitating our offspring’s attainment of their every dream, perhaps we should also foster more realistic aspirations too. Because as awesome as she is, Mimi is NOT getting up that tree, not yet anyway. But hey, who am I to say she won’t one day – and sure enough I’ll be waiting below, to catch her all the times she falls off! Next Post The Dad-Vinci Code – now with clumsy animation!